Mediterranean food's robust flavors and uncomplicated preparations have made it a favorite of Americans, but we do not always know how to best prepare it ourselves. Focusing on the region's vegetarian dishes in particular, Clifford Wright has assembled this impressively thorough cookbook and kitchen reference. 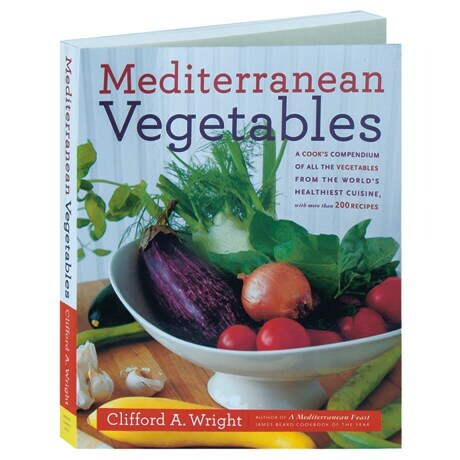 From "acanthus-leaved thistle" to "zucchini," each entry describes a vegetable, herb, or flower and explains its culinary history; many of the entries also include recipes, and among the standout dishes are Tunisian-Style Mixed Vegetable Stew, Potato Gnocchi, Lentils with Scallions and Coriander Leaves, Egyptian-Style Fettuccine with Onions, Spiced Mushrooms on Fried Bread, and Spinach Torte in Breadcrumb Crust.